Before any discussion of dresses, glamor, fashion (or faux-pas), and dresses once again, I need to mention the one who stood out most to me during this year’s Oscars Awards Ceremony. Not at all surprisingly, Heath won the Best Supporting Actor Oscar Award for his performance of the Joker in the Dark Knight. And no other man deserved this more. 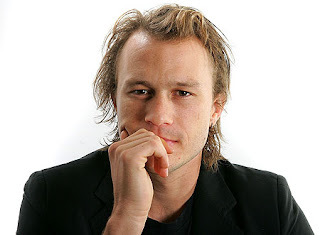 It is unfortunate when men as great as Heath have to leave us so early. But although Heath could not be on that podium to accept his award, and although his parents were on the stage where he should have been–where we all would have liked to see him–there was still that rare and strong emotion across the audience’s eyes that only Heath could have provoked. The same feeling I experienced the first time I watched one of Keith’s performances (“Ten Things I Hate About You”) and the last time, too (“The Dark Knight”): a mixture of love, admiration, compassion, envy, enthusiasm, respect and euphoria. His humble attitude left me ever wondering…what’s a girl to do with Heath…give him a big bear hug or seduce him? Such was Heath: lovable, yet humble; seductive, yet serious; rebellious, yet devoted. And to many of us, he still is.